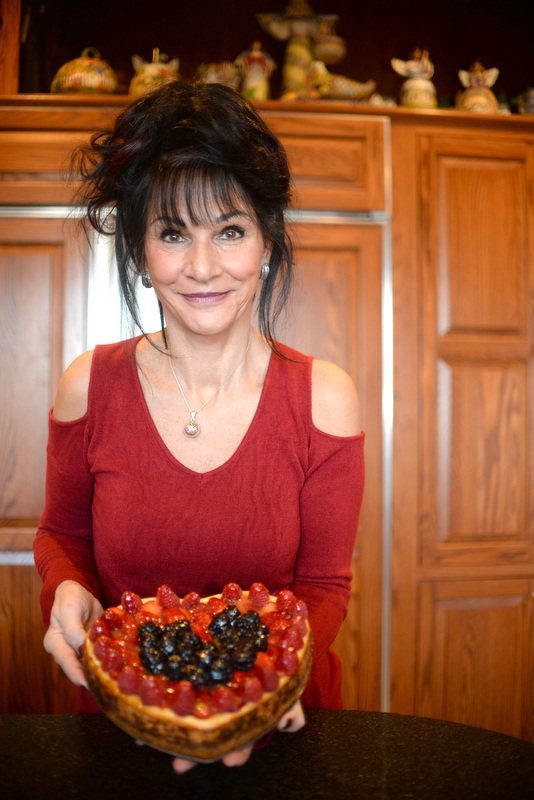 Judge Rosemarie Aquilina invites us inside her kitchen, where she’s making a special Valentine’s Day dessert! Learn how to make her heart-shaped lemon cheesecake. This lemon cheesecake makes a beautiful centerpiece and says “I love you” to the special people in your life. Valentine’s Day is the perfect opportunity to show someone you love just how special they are! 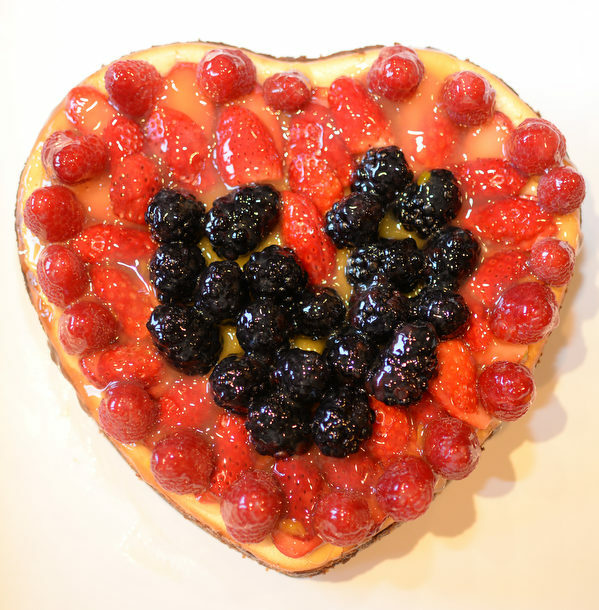 Judge Rosemarie Aquilina bakes a lemon and berry cheesecake in her kitchen. My teenager loves everything lemon. When she wanted a cheesecake smorgasbord for her birthday, I knew that lemon was the key to her smile. I experimented with various flavors and cake shapes. The layered lemon flavors in this lemon cheesecake complemented by the taste and texture of the fruit was an instant success. 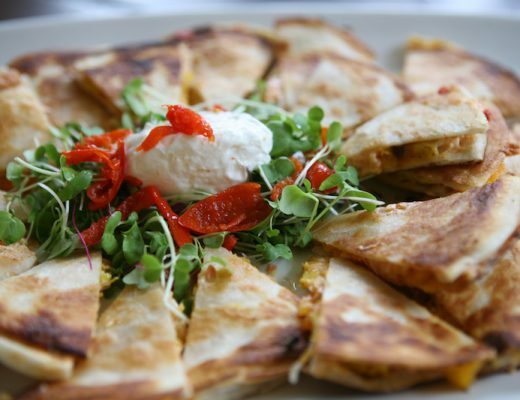 Each time I serve this there are no leftovers! Combine above ingredients in a medium mixing bowl with spatula until all crumbs are moistened. Press crumbs into a 9-inch spring-form pan. You can use a 10-inch or 12-inch pan for thinner cheesecake but baking time of cheesecake will decrease. Press crumbs up the pan’s side approximately a half inch, then press crumbs into place with the flat side of a glass to smooth. Place on middle oven rack and bake for 10 minutes at 325 degrees F.
*Use three whole eggs, plus the egg white of the fourth one, saving the egg yolk for the glaze. 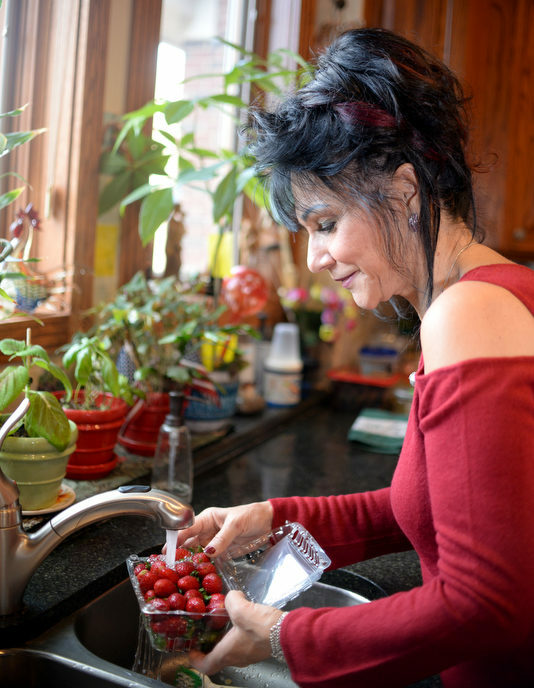 Judge Aquilina washes strawberries to prepare for the topping. In an electric mixer, combine cream cheese, sugar, flour, lemon juice, lemon zest and vanilla until well blended. Add eggs one at a time, blending well after each addition. When well blended, pour remaining egg white over crust. Judge Aquilina prepares the crust for her cheesecake in her kitchen. Bake at 450 degrees F for 10 minutes. Reduce heat to 250 degrees F for 45-55 minutes until knife inserted in center comes out clean. Cool before removing from the pan. 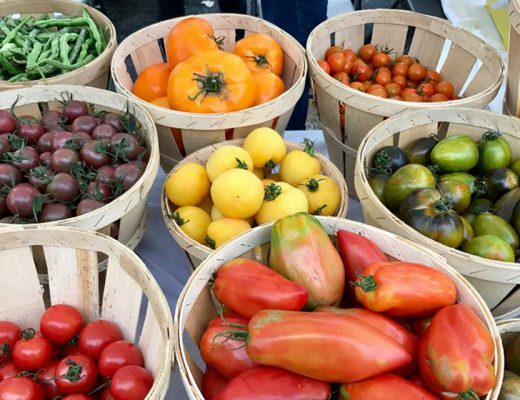 If there are cracks, don’t worry — they will be covered up by the fruit. Once the cheesecake is completely cooled, arrange your choice of fruit on top. If desired, omit the fruit and just place the glaze on top. Refrigerate until cold or overnight and serve with your favorite fruit and/or whipped cream. Judge Aquilina slices strawberries for the topping. In a medium sauce pot combine the sugar and cornstarch. Then add water and lemon juice. Cook over medium low heat until clear and thick, stirring occasionally. Using the leftover egg yolk in a bowl, add a tablespoon of the thickened glaze and stir vigorously so that the egg does not curdle. Add a few more tablespoons of glaze until the egg is well incorporated and the mixture is about the same temperature as the remaining glaze in the pan. Remove pan from heat. Return glaze with egg to full glaze mixture and stir until well blended, ensuring again that the egg remains incorporated and doesn’t curdle. Pour over the fruit on the cheesecake. I use a brush to coat all areas. 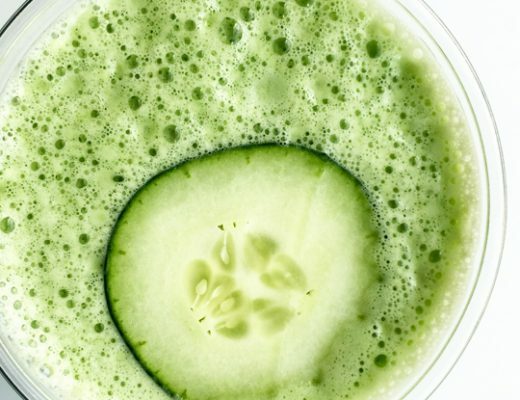 Refrigerate until you serve. You can pour glaze over cheesecake without any fruit. 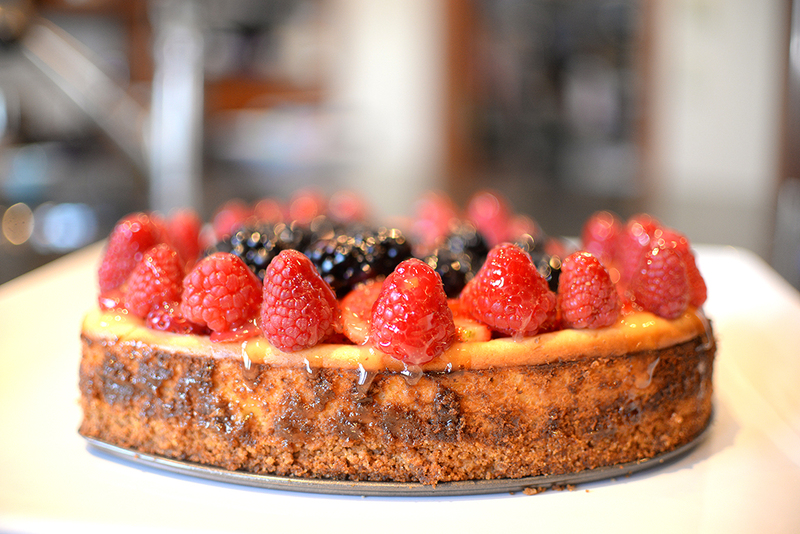 The finished lemon cheesecake topped with berries. Tried this recipe today as I love all things lemon and all things cheesecake and it didn’t disappoint. The recipe was so easy, but makes a big impact. The flavor wasn’t overpowering but still unmistakable. Do yourself a favor and try this out—it’s a keeper! !